Make applesauce cake into a layer cake, bundt cake, loaf cake or bars. Photo courtesy Kraft Foods. 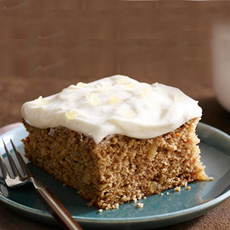 June 6th is National Applesauce Cake Day, a holiday that celebrates a cake that’s fallen out of the popular repertoire. Applesauce cake is a spice cake, made more moist with the addition of applesauce. It can be served plain, with tea or coffee; or made into a more formal dessert topped with whipped cream or lemon curd. Culinary historians place applesauce cake in the early twentieth century. It is believed to be a direct descendant of 19th-century spiced fruit cakes made with fresh or dried apples and lightened with baking soda. 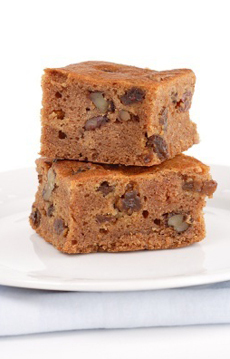 Fruit cakes themselves were traditional medieval European recipes. Recipes begin to appear in cookbooks around 1915. During World War I (1914-1918) they were promoted as “patriotic,” requiring less butter, sugar, eggs). In the late 20th century they were repurposed as healthy (less cholesterol, lower fat). See our Cake Glossary for the different types of cakes. This cake will taste much better if you make your own applesauce (recipe), rather than using apple sauce from a jar. You can make a spicier cake by adding 1/4 cup finely diced candied ginger (our favorite!) or with powdered ginger. This is a classic recipe. You can modernize it with the addition of rolled oats, chocolate chips and other favorites. Plain bars are delicious, but we love to add cream cheese frosting. Photo by Margo Edwards | IST. Preheat oven to 350°F. Butter and flour a 9-inch pan or bundt, or a loaf pan. For thin squares of cake, or a layer cake, use two 8-inch pans. Mix applesauce, brown sugar and shortening. In a separate, large bowl, sift together flour, baking soda, salt, cinnamon and clove (and optional powdered ginger). Add the applesauce mixture and blend well. Stir in the raisins, nuts and optional candied ginger. Bake for about 40 minutes or until a cake tester or toothpick comes up clean.